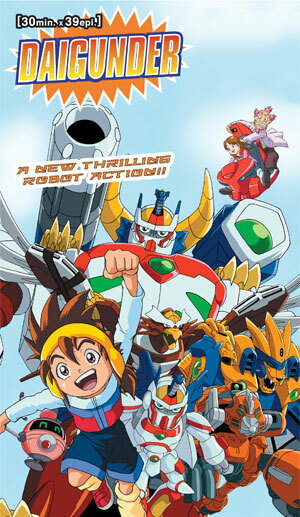 Showing weekly in the timeslot at 6pm every Friday, "DAIGUNDER" is successfully being aired on TV Tokyo since April 5, 2002 and gained high acclaims from the audience with a strong support by the leading toy manufacturer, Takara. The story takes place in the future, and the battles between robots are sport played by licensed "commander", illustrating friendship and sense of value through relationship of a boy and a robot. In the near future, robots are put to practical use and play important roles in every part of the world. "Battle Robot Match", a kind of sport which requires robots to play a game, is very popular. The rule is: 2 teams of robots are lead by commanders who obtained licenses beforehand, fight against each other at a stadium or a kind of colosseum and there are no restrictions on the types of robots. What is crucial for winning a match is harmonious combination between commanders' ability and their robots. Aiming at "Titan Clauser", the legendary championship of the "Battle Robot Match", the main character, Akira has been training very hard to get a license as a commander of Battle Robot Match. At last he got new robots, "DAIGUNDER", which were developed by his grandfather to participate in a rookie's tournament. © 2003 We've Inc. Licensed by Animation Int'l Ltd.